I had an interesting email inquiry through my website last fall. 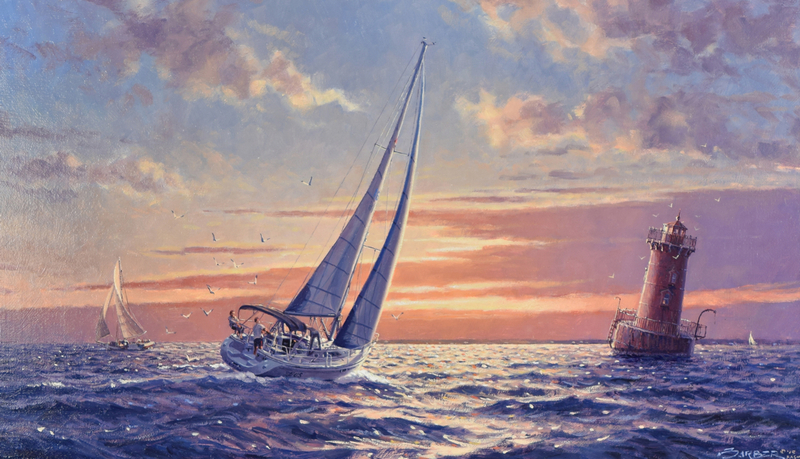 A lady asked if I would paint their Catalina 309 sailing sloop and explained that she and her husband would often sail from their home in St. Michaels, Maryland down the Choptank River and into the Chesapeake. Sometimes they’d pass by the old Sharp’s Island Lighthouse late in the day and would enjoy a leisurely dinner underway with a beautiful sundown as their backdrop. I eagerly accepted the opportunity, fondly recalling many such experiences in my past sailing life aboard my Cape Dory Albatross. Myra sent photos of their boat Eos and the painting was scheduled for this spring. 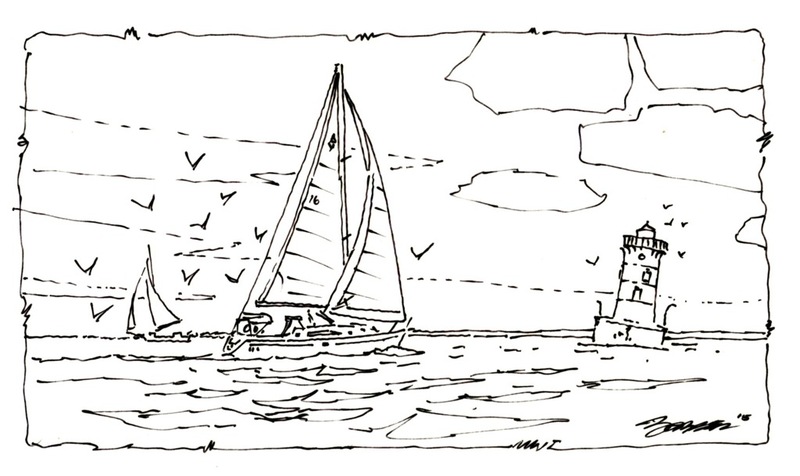 I did two sketches of Eos; one off the leeward beam and one of the leeward quarter, both with the lighthouse ahead and a sundown sky over the Bay’s westward shore. 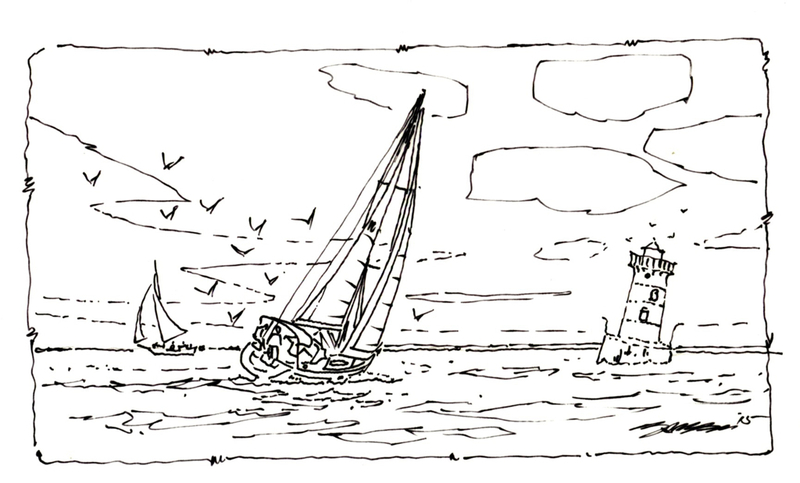 The Gons chose the second view; off the starboard quarter as it suggested more motion. The Sharp’s Island lighthouse is three miles offshore from Tilghman Island, Maryland. It is unique in that it is a cast iron tower on a concrete base built in 1882 and was tilted by a heavy ice floe in 1977. Anyone sailing up or down the Bay would pass by the light. After approval of the second sketch the clients, whom now I regarded more as friends due to our many conversations and similar family ordeals that we were enduring, I began the oil painting. Upon completion I emailed a photo to Myra who with Steve’s input quickly approved the piece. 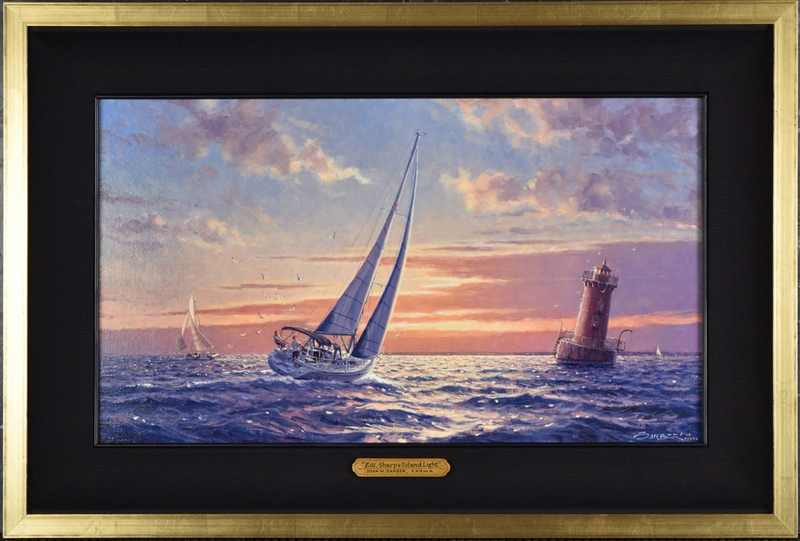 They requested a contemporary frame similar to the one on my website that Betsy Cronkite chose for Walter’s painting of their sailing yacht Wyntje. What a great pleasure it has been to work with Myra and Steve and even though we’ve never met we plan to in the near future. “Eos” is oil on canvas 12″ x 21″ with an overall framed size of 16″ x 25″. Below are two initial sketches as well as the framed oil painting.